Color mascara is a fun eye makeup look. If you're looking for a playful and eccentric cosmetic staple, color mascara is sure to frame your eyes while providing a swoosh of drama. Color mascara is a cosmetic trend that goes in and out of style. While some color mascara fads are best left in the clearance bin at the drugstore, other color mascara choices are necessary for special effects. Not only can colored mascara enhance and highlight your own eye color, it can also provide a theatrical edge to your makeup palette. Mascara is normally used to separate the eyelashes while adding volume and depth. Available in both a cream or cake and wand application, mascara also has several formulations that cater to different needs. Some mascaras lengthen, while others add volume and fatten up the lash diameter. Other mascaras separate thick lashes, and a few brands even promise to curl the lashes. All of these choices make mascara buying truly individual. Adding to the selection of mascara is the color options. While black and brown mascara offer up the most versatility, color mascara is an excellent choice for those who love experimentation and funky eye makeup looks. Celebrities like pop star Rhianna and Christina Aguilera have revamped the colored lash trend. Eye-popping hues can be found allover the red carpet and the runway. Here's a look at some of the most popular color mascara options and tips on how to wear them, day or night. Popular in the eighties and with the punk scene, blue mascara choices vary from electric blue hues to regal turquoise peacock shades. 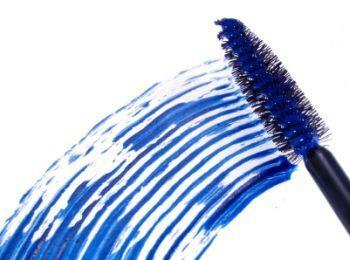 If you have blue eyes, a blue mascara will certainly flatter your peepers. A great look when wearing blue mascara is to flaunt a tone on tone palette. Draw focus to your blue eyes by wearing blue eye shadow, blue eyeliner and finish with your blue mascara. Women with hazel or brown eyes can wear blue, but will look better in some of the other color mascara choices. Purple mascara is a dramatic cosmetic staple that really makes hazel or green eyes pop! Although purple mascara may sound intimidating, a rich plum hue can be very sophisticated and flattering. To keep a purple mascara conventional, pair it with warm berry eye shadows and a chocolate brown eyeliner. Purple mascara is a sizzling summer makeup staple that looks great with bronzed skin and flirty dresses, so be sure to pack this hue for your next tropical vacation! Green mascara is a very theatrical look that, when worn properly, looks fantastic! Green mascara can be worn alone to enhance emerald green eyes, and can also be worn with funky eye makeup techniques to provide a head turning gaze. Pair green mascara with oceanic hues such as pearlescent or oyster eye shadows, silver eyeliners and shimmery lips for a look that will surely make others green with envy! Glitter mascara is a fun way to add a disco diva look to palette. When worn alone, glitter mascara can add a much needed touch of sparkle. When paired with silver or white glistening eye shadow and glossy lips, glitter mascara is magical and enchanting. Application is key when applying glitter mascaras. Make sure the mascara wand remains on the lashes and prevent small glitter particles from entering the eye area by avoiding the base of the lash line. If you're ready to ditch the basic black mascara and opt for a dose of color, the following Internet retail sites sell colored mascara varieties. In addition to online shopping, color mascaras can be found at department store cosmetic counters and in the drugstore beauty aisle. With so many affordable varieties on the market, mascaras are a budget-friendly splurge. Whether you strike a blue hue or play it perfect with purple, colored mascaras are a fun way to perk up your cosmetic palette!